We have very little in the way of original details. The only place where we have original details is on the front façade. Our goal is to have a pretty traditional exterior and a completely contemporary interior. The main front door to the house (parlor level) has been a big question mark. Initially we were going to do a completely contemporary french doors with a transom over them, but the NY Office of Historic Preservation nixed that idea because they see the front door as one of the most important parts of our entire house. So we opted instead for recreating the original doors. The problem with that was the picture to the right was only record of what our doors might possibly have looked like – and it’s a rather fuzzy picture and of our neighbor’s place, not ours. Also, it appears the door was originally all wood but we want some glass in our door. We figured if we tried to recreate the panel pattern, that Historic Preservation might let us get away with having some of the panels be glass instead of wood – but that was a gamble. 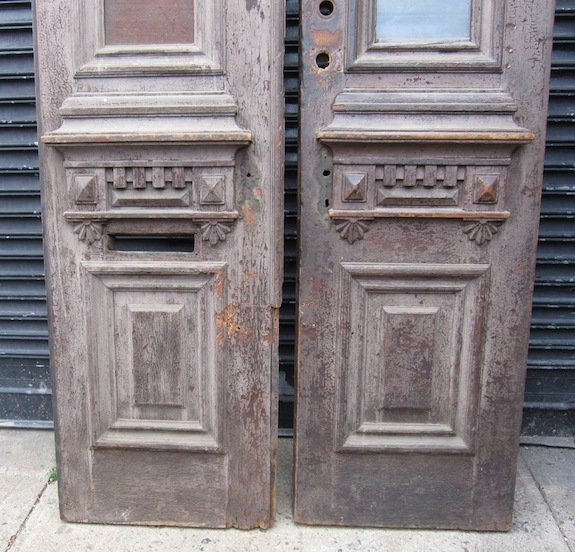 I always had using doors salvaged from another townhouse as an option in the back of my mind. 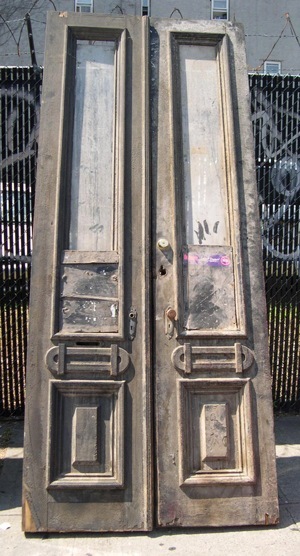 We had been to Demolition Depot last year and I had seen doors that seemed like they’d work. They needed to be restored, but they were more or less the right size. Dan was skeptical – he was convinced things at Demolition Depot would all be in horrible shape or we wouldn’t find the right size. I got him over there the other day to “look at how old doors were constructed” and luckily the doors I had seen last year were both still there. We took our contractor over to look at them and he’s game for using them. I also checked with historic preservation and they said it’s OK to use an old door – though we’ll need to submit an amendment. The top contender is the door to the right. It’s the perfect size – 48″ wide, 119″ tall. It’s also in relatively good shape – though someone did cut a huge mail slot through the door at some point, but recently we’ve been thinking we’d go with a mail slot in the door instead of a mailbox – so the mailslot is OK with us. It’s also got glass – which we’re really happy about. Now there’s no problem with historic preservation about having glass in the door. The plan is to restore it and put new beveled, leaded glass in it. It should be pretty spectacular when it’s done. The question is whether to paint it or stain it. Dan really wants it stained, but I don’t think that’s practical. I think the repairs will be too visible if it’s stained. I think the way to go is to paint it. I love all the detail. 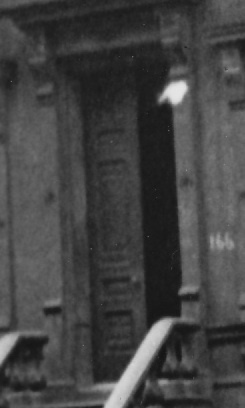 I just don’t think we would have gotten that level of detail if we had had a new “replica” door built. All in all I think it’s sort of exciting to give old doors a new life. One of the principles of historic preservation is to not introduce “fake original details”, but clearly there’s an exception when you’re using doors another similar building in your neighborhood. Also, I think the decision might have been different if other of our sibling townhouses still had their original doors. Since all of them lack their original doors, there’s no continuity problem. 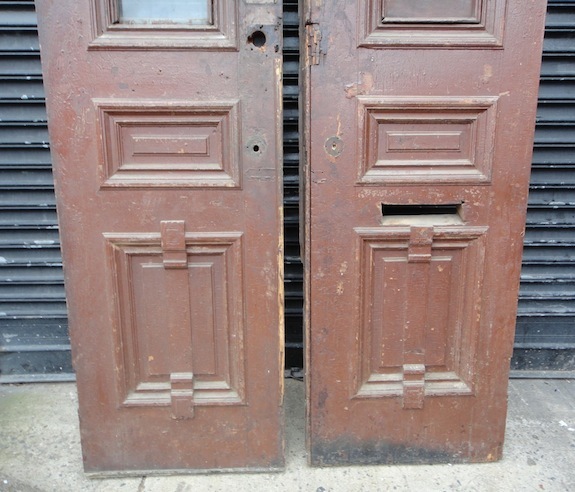 One thing I should mention… The old doors aren’t as airtight as new doors would be. One decision we made a while back was to consider the vestibule to be exterior space. We’re going to insulate the walls of the vestibule as if they were exterior walls. That means the main doors can leak as much air as they want and it won’t affect our heating/cooling bills. The interior set of doors will be proper, factory-made, contemporary doors that will be airtight. It looks like we’re also going to get some balusters for our stoop railing from Demolition Depot. Unfortunately they don’t have the railing to go over them – so we’ll have to have that fabricated. This entry was posted in Construction & Renovation and tagged Landmarked Buildings / Historic Preservation, West 123rd Street Harlem Brownstone by Jay. Bookmark the permalink.